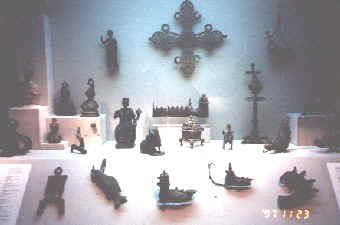 and statues in the early/middle Byzantine collection. In addition to the Cloisters collection uptown, the Metropolitan Museum of Art has a medieval art collection located on the first floor in the main building on 5th Avenue. The collection extends from the 4th to the 16th century, and covers many distinct areas such as Byzantium, Early Christian and Gothic art. In 1917, J. Pierrepoint Morgan gave the Museum many works of art, which strongly supplemented the collection along with various gifts from other collectors. Artifacts are only a small part of the medieval collection that also includes various paintings, tapestries and armor/weapons.